Millions of readers around the world have fallen in love with the novels of the New York Times bestselling author Adriana Trigiani. In Home to Big Stone Gap, she tells her most powerful story yet, full of humor and heart, wisdom and hope. 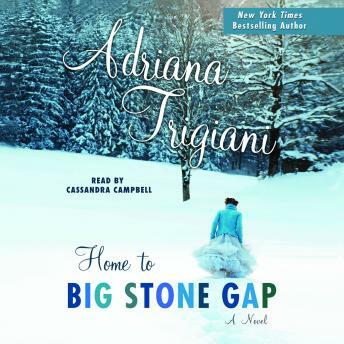 Nestled in the lush Blue Ridge Mountains of Virginia, the town of Big Stone Gap has been home for Ave Maria Mulligan Machesney and her family for generations. She’s been married to her beloved Jack for nearly twenty years, raised one child and buried another, and run a business that binds her community together, all while holding her tight circle of family and friends close. But with her daughter, Etta, having flown the nest to enchanting Italy, Ave Maria has reached a turning point. When a friend’s postcard arrives with the message “It’s time to live your life for you,” Ave Maria realizes that it’s time to go in search of brand-new dreams. But before she can put her foot on the path, her life is turned upside down. Ave Maria agrees to helm the town musical, a hilarious reunion of local talent past and present. A lifelong friendship collapses when a mysterious stranger comes to town and reveals a long-buried secret. An unexpected health crisis threatens her family. An old heartthrob reappears, challenging her marriage and offering a way out of her troubles. An opportunistic coal company comes to town and threatens to undermine the town’s way of life and the mountain landscape Ave Maria has treasured since she was a girl. Now she has no choice but to reinvent her world, her life, and herself, whether she wants to or not. Trigiani is at her best in this exquisite page-turner. Home to Big Stone Gap is an emotional and unforgettable journey that reminds us that you can go home again and again.